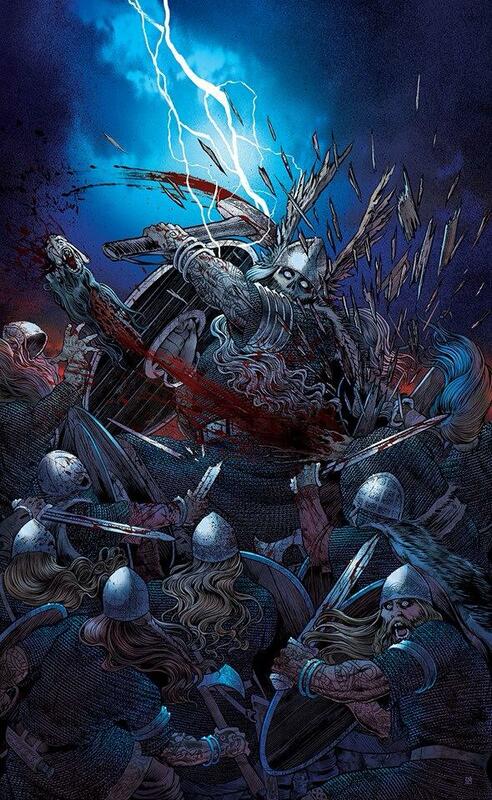 American illustrator, Christian Sloan Hall is widely known in the Metal world for his striking, Viking-laden imagery for Swedish metallers, Amon Amarth. In addition, he's also produced visuals for Dimmu Borgir, Testament, Insidious Disease, Sunn o))) and many more. Last year, he had the opportunity to create an exclusive artwork for the Rock And Metal Museum, which takes place at the prestigious UK Metal gathering, Bloodstock Festival. 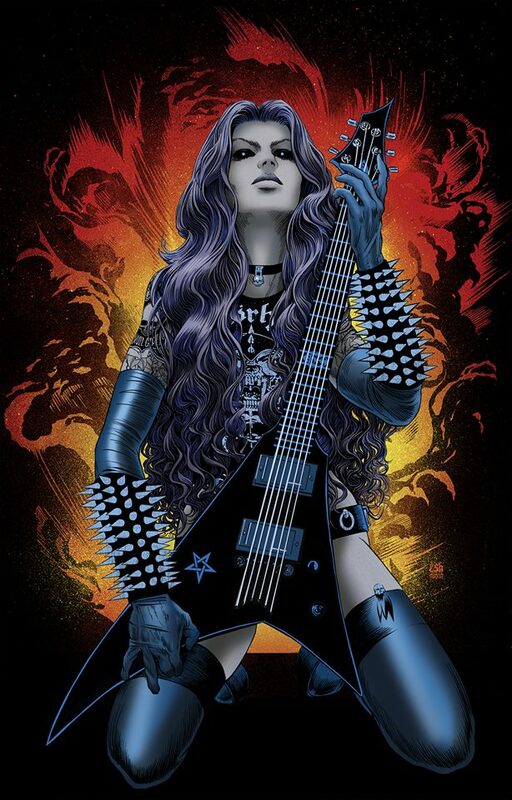 The comic book-influenced image features a fierce female heavy metaller and was personally commissioned by Bloodstock's organizer (and celebrated visual artist) Paul Raymond Gregory. 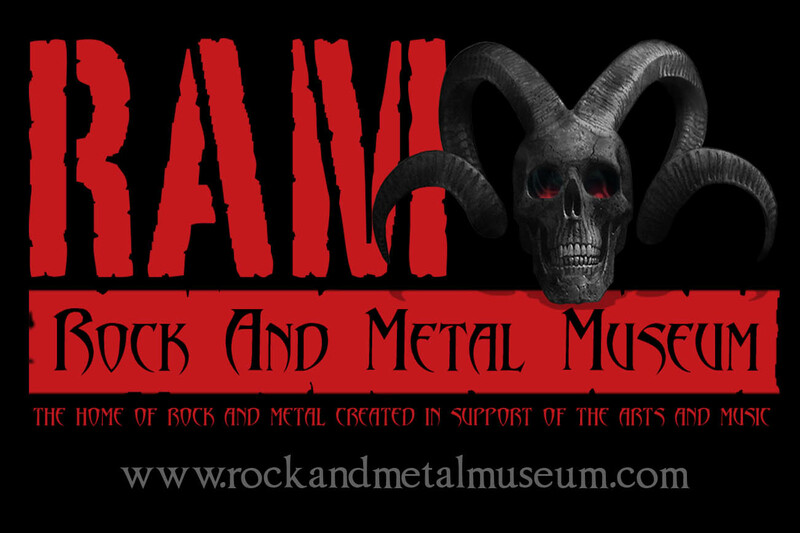 This coming August (from the 10th to 13th) the artwork is returning to this year's edition of Bloodstock and the Rock And Metal Museum. A limited edition of fine prints will be available during the event. Below Sloan Hall talks about the image and his plans Bloodstock/RAMM 2017. This image was originally featured on the Rock And Metal Museum during Bloodstock 2016. How did you initially got involved with the festival? Christian Sloan Hall: Well, I met the Gregorys back in '08 when my friends in Dimmu Borgir headlined the festival. I've been a fan of Paul Gregory's work for ages so I would always jump at the chance to talk to him whenever I saw him there at Bloodstock. Then in 2014, my good friend Dean informed me that Paul was going to start featuring other artists in the RAMM gallery, so I dropped my friend Vicky, Paul's daughter a line asking about it and the rest is history! The artwork below was originally unveiled last year at Bloodstock’s Rock At Metal Museum. What inspired you to create this artwork? Christian Sloan Hall: The artwork was created especially for RAMM at Paul's request. Lemmy of Motorhead had just passed away earlier that year and Paul told me of his plans to set up the Lemmy bar at Bloodstock, and that the RAMM gallery would be housed within, in tribute to Lemmy's incredible contribution to Metal and Punk culture. So, Paul asked me to create an image that embodied what Motorhead meant to me personally, and that was no easy task! So, the Motorhead t-shirt this lady is wearing is not a coincidence. There’s in fact a clear Motorhead connection. Right? Christian Sloan Hall: I was born in Los Angeles and grew up listening to Motorhead as my older brother Kyle was a huge fan as were most punks/ Metal heads back in the early eighties. My brother Kyle and Misha took me to my first Motorhead gig in '88 I think it was, at the Santa Monica Civic where they were playing with Suicidal Tendencies, and a huge brawl broke out when Motorhead came on and it grew into a riot. I'll never forget Lemmy singing up in to the downturned mic over a sea of swirling violence! But as the riot grew and people were fleeing out of the venue to be met by a plexiglass shield wall of riot cops, it was the most intense gig I've seen to this day! And though out the ‘80s I experienced a lot of the Metal scene in Hollywood and what impressed my young mind the most were the crazy hot Metal chicks and the debaucherous glam filth you would see happening at the gigs when my brothers band played at these Hollywood venues like the Troubadour, the Roxy, Whisky A Go-Go, Hollywood Palladium, to name a few. And then later when I was older seeing gigs up there, we would always end up at the Rainbow bar and grill on the sunset strip, which became a mecca for Metal Heads and Lemmy would be there quite a bit, playing Pac Man or just getting pissed. So, the Metallic Motormaiden I painted is the embodiment of all those experiences. Fine prints of the artwork will be available at the Rock And Metal Museum this. Can you tell us more about it? Christian Sloan Hall: They'll be crushingly glorious full colour prints, and she may be The Unattainable Metallic Motormaiden 'occultress' of Doom, but her beauty can be possessed in print form! But only limited to 50 I believe. And they'll all be signed and numbered by myself. 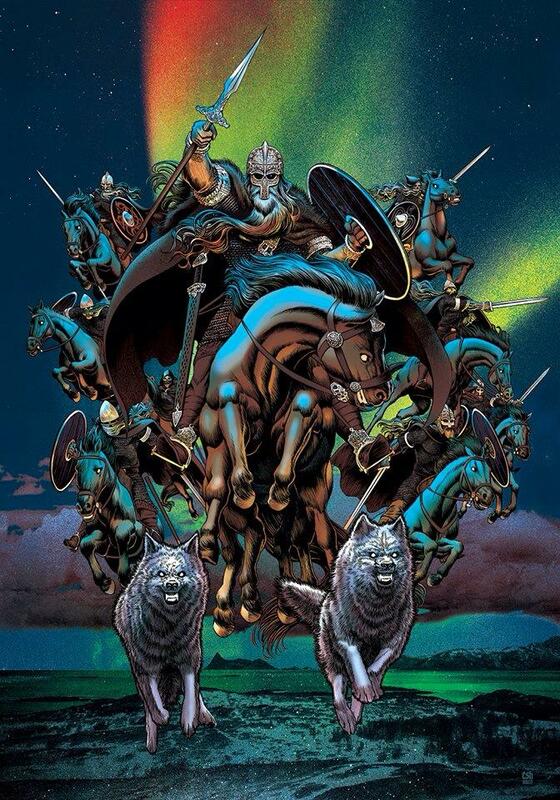 You're also exhibiting other works at Bloodstock this year—specially your work about Amon Amarth. Christian Sloan Hall: Yes, Amon Amarth are headlining this year, so Paul thought it would be cool to display some of the work I've done for them over the years. 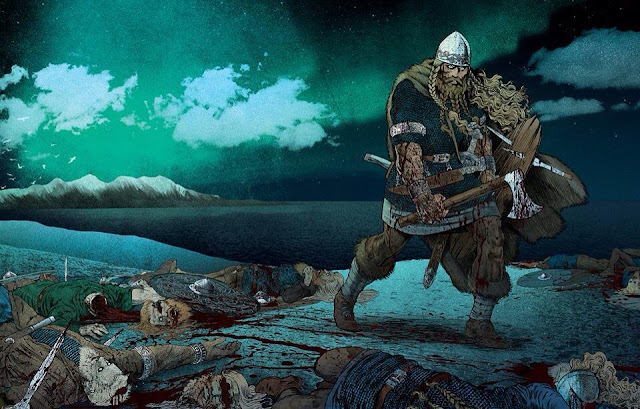 So, two of the battle scenes I've done for them that have been used for backdrops will be on show, as well as some of the illustrations I've done for tour shirts, and a few others like some pieces I've done for DC snowboards, all in the theme of Viking battle arting. In your opinion, how important are venues like Bloodstock’s Rock And Metal Museum to help promoting Heavy Metal-related art? Christian Sloan Hall: It's beyond important, it’s vital! 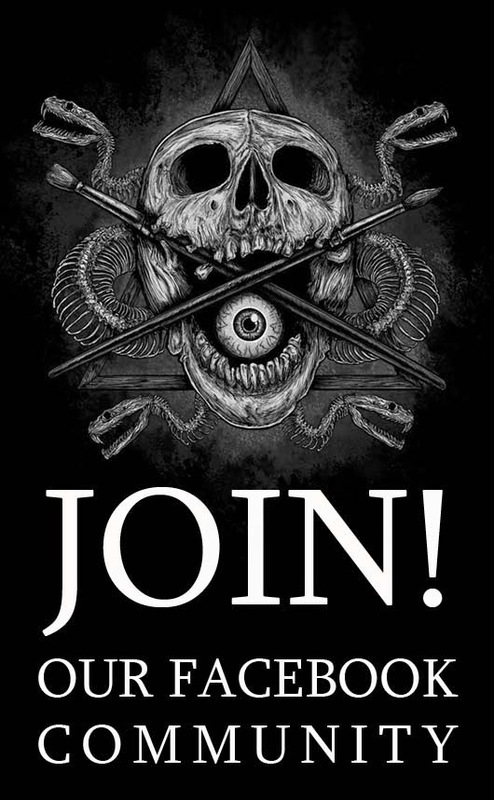 the once flourishing Illustration industry has been a dying one for decades, struggling to survive in the face of constant exploitation and digital emulation. Events like this are crucial in the battle to keep the industry alive but restore Illustration and art to its former glory Paul Gregory's efforts in this struggle are heroic and I'm greatly honored to be able to be a part of it! This is one hell of an artwork! I was watching SmartPaperHelp video review to be ready for the new university season and now I have the greatest idea about t-shirt design, thanks to your post here.